As you know, I am more of a jazz and swing girl. Love the blues as well. 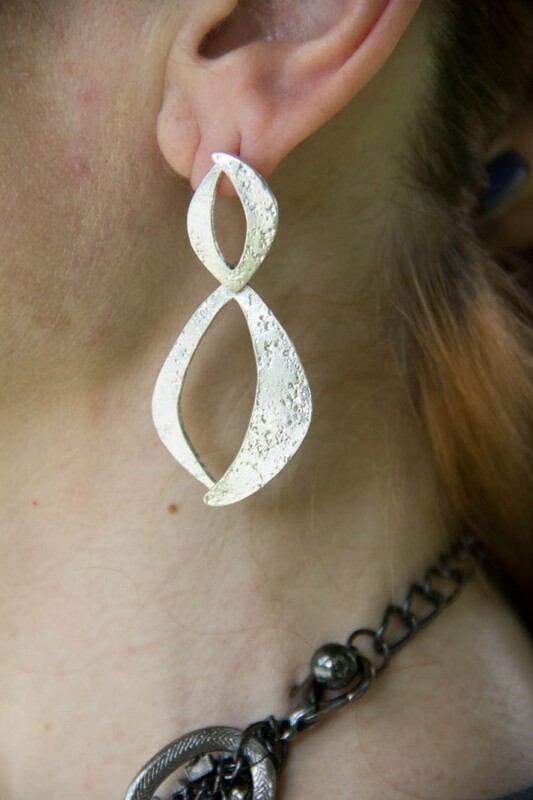 Today, the name is referring to the silver metal jewelry I am wearing as well a the metallic earrings. Got the idea to pair the metals as I pulled out this silver shiny top from Ann Taylor. I iniitially bought it to wear for the holidays, but hey, why can’t we sparkle anytime? Paired it with my Ann Taylor crepe long skirt, some black kitten heels and a touch of blue with my structured bag. ( I know you are still having a hard time shaking that image of me being a heavy metal headbanger out of your head now!!) but I had the hair, the love for the music and musicianship, and some of the attitude, Now, take your thumb and your and your pinky, and listen to some of your favorite Metallica songs! Ha! I love seeing different metallics on people in the form of shoes, jewelry, clothes. I am fond of bronze and willl have something coming up next month to take care of that. I will be going to the beach soon, but will have some posts planned in the meantime, I am in desperate need of a vacation!! I had a very similar skirt, that appeared like diagonally sewed together stripes. Unfortunately I had to let it go after pregnancy because I slimmed significantly and it would have been too much work to nip it down a size or two. And I had a headbanging phase too. Now, I still listen to the music from time to time, but it is very much mixed up with lots of other genres. Lol, little does everyone know, eh? I was also into the thrash metal scene back in the day – my ex was in a metal band, so yeah, Metallica, Slayer, a little Iron Maiden, and throw in a little Sepultura for speedy fun! I actually co-wrote a song with his band. I had the big pouffy hair! Love your metallics! Thanks for visiting my blog, Jess! Ha! See what we don;t know huh> Yes, Slayer, I went to an Iron Maiden concert back in the day. Neat that you cowrote a song. I still play guitar as my major was Jazz Guitar, and I also had big poufy hair!! I love this gunmetal grey color on you, looks stunning with your beautiful red hair. And you necklace blends in so well with the top. I also love the midi skirt length, such a classy and current length for skirts going into fall. You look fab! I love a simple black skirt. It’s classic and you can wear it so many different ways. You look beautiful as always. Visiting for the first time. I Love to see my 40+ ladies rockin’ their styles and you look GREAT. As always, you look fabulous! Such a great look for transitioning into fall! Love your skirt! The midi looks fabulous on you! I know what you mean about needing a vacay, we leave for the beach on Monday! Thank you! We just came back from Kiawa Island in Charleston, it was a great time. Have fun on your trip! Gorgeous jewels as always but I am truly in love with that black bias skirt! WOW. You look wonderful Jess! I love the metallics on you. This is too funny but I have post scheduled that’s titled heavy metal too!! Enjoy your vacation! Metallics look great on you! I love that necklace! I love the metallics too. I would love to own your stunning necklace, so chunky. Gorgeous bag! Love the outfit, especially the skirt. It looks very comfortable, you could dress it up or down! You don’t look like a headbanger! But I still love that music, too. Silver is trending for Fall, and you’ve got a great jump on it here, Jess. Thanks for sharing with Visible Monday, xox. Now here is something hard to believe…I was also a bit of a head banger!! I like this skirt alot…you can do so much with it! Have a great Monday, Jess. The necklace pairs so nicely with the blouse. Heavy Metal’s not my thing, (except maybe a little Richie Blackmore…oops did I just date myself?) ;-). I’m a jazz fan too. Love how you make this unpredictable color oh-so stylish with all the details you added Jess…have an equally fab week!!!! Wow I do love this colour on you. Pewter is such a pretty metal colour.